Just a friendly reminder that while not extremely common there are Copperheads in the park... and late summer and early fall they seem to be more active. Happened to run into this big girl back on Fri 9/9 at Blue Hole just after the bend below the Spring. Before anyone gets worked up I DID NOT kill it (someone just before me must have though). It was one of the largest Copperheads I have seen and was 38"+ long and had a heck of a big set of fangs to boot. I called the park and let them know as I didnt want any kids messing with it or anyone else to flip out when they saw it and they advised they were going to send someone to pick it up. Shortly after seeing that one there was another smaller Copperhead coiled up on the gravel road near between the two gravel lots below the spring. Not sure if they were a mating pair or what but it has been about 6 or 7 years since i saw my last Copperhead on the current fortunately. And I made sure to use a long stick to check it out so no worries I wasn't at risk of being bitten. It is ashame that people kill watersnakes in the park but there ARE Copperheads around so just be careful if you are walking barefooted or have kids running around. Saw 2 Saturday at Parker, another a few weeks ago. A few months ago a girl was bitten on 6520 near lower parker school while walking up the road at night in flip flops. 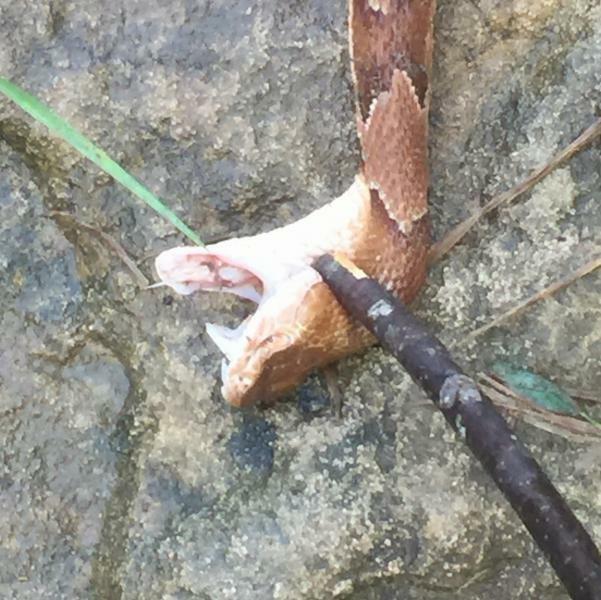 I've seen several people post about killing copperheads on Facebook recently too. 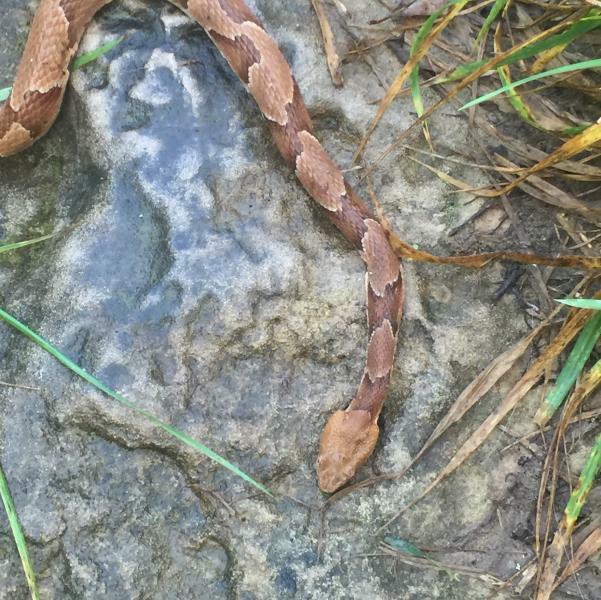 Many of them have killed multiple copperheads recently. Are they doing some sort of fall migration or is this just a freak occurrence? 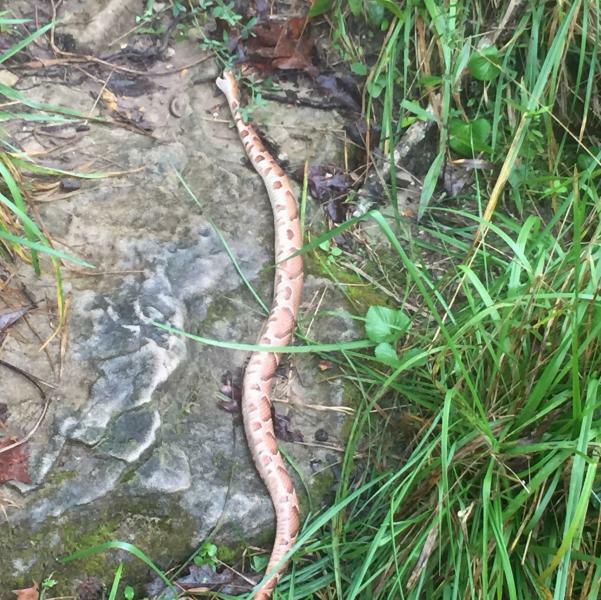 I don't recall seeing that many people posting about copperheads at one time in the past. I'm not sure when I even last saw a copperhead on the road or up close. I'm about an hour and a half north of Montauk. I have heard it is some fall migration deal but I'm no Herpetologist haha. It is funny you say that Seth because quite a few of my friends said the same thing that they are seeing more/killing more this year. Moving around to hunt and fatten up for winter hibernation. Moving to the winter den areas in rocky bluffs. We have an area across the river in IL that closes a road for migrations in spring and fall. They move from hilly bluff area to lowland swampy area. Snakes, turtles, and salamanders all migrate across the road. They do the same thing along the Katy Trail in the fall. Last year we saw dozens of snakes over a 2 week period. Two large copper heads on the same day too. It seems they come down out of the bluffs, cross the trail heading to the low land near the river. Pretty cool if you ask me.